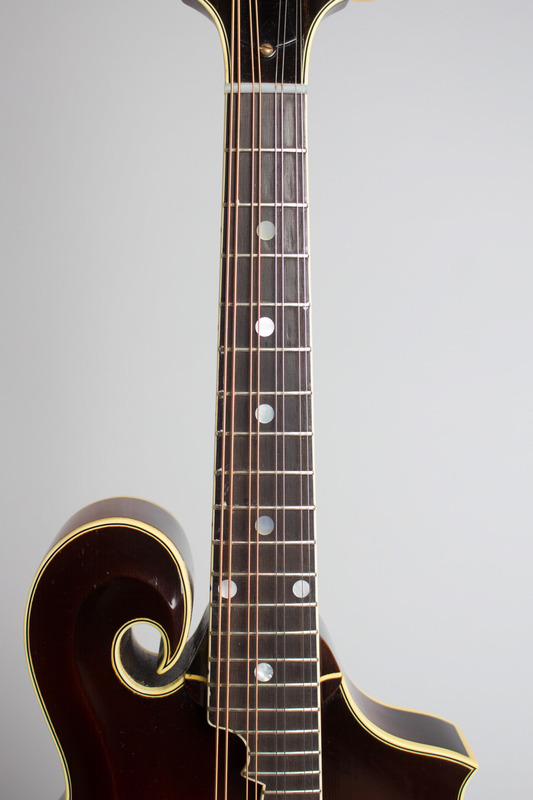 Monteleone Grand Artist Model Carved Top Mandolin (1982), made in Bayshore, New York, serial # 76, sunburst finish, curly maple back and sides, spruce top, maple neck with ebony fingerboard, original black hard shell case. 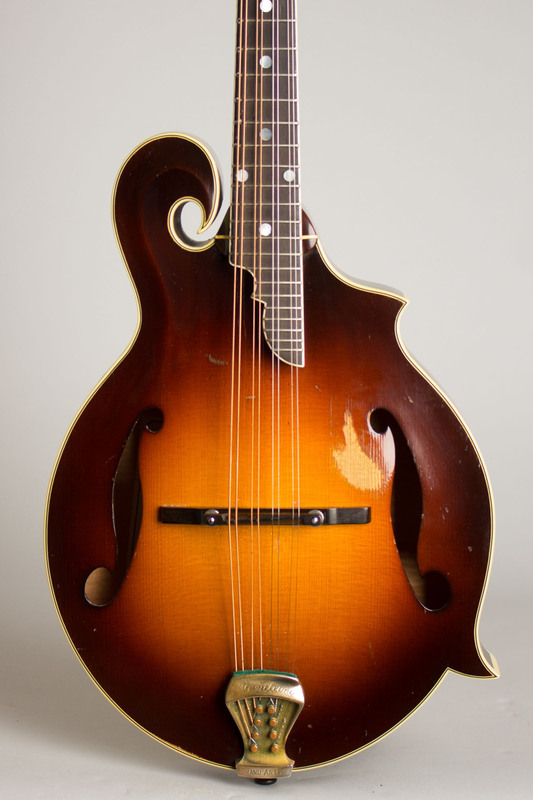 John Monteleone's Grand Artist mandolin is one of this venerated builder's signature creations, and generally considered one of the best of its type ever made. Not content to simply copy the Gibson F-5 as many have, Monteleone re-thought the design in the late 1970s and it emerged as the Grand Artist. Monteleone essentially took the high-art Art Nouveau F-5 and streamlined it into a more Deco layout without losing the essentials. 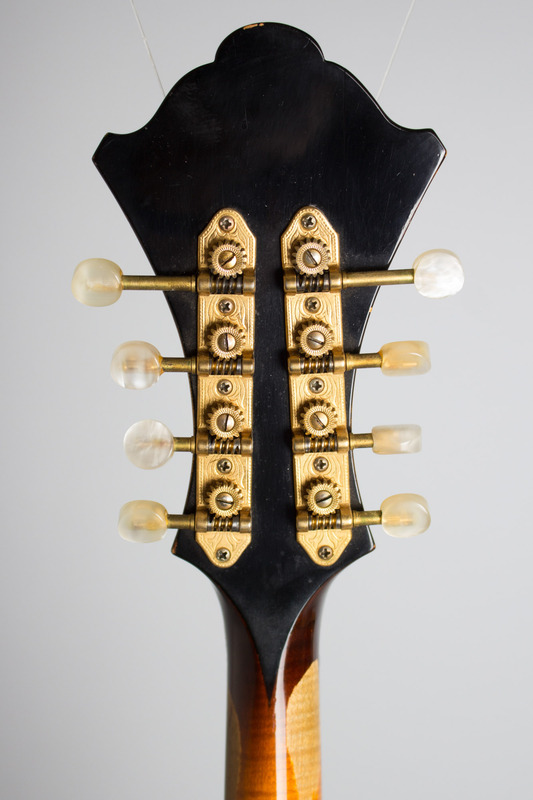 His symmetrical headstock flares out in an elegant Art Deco shape that would not be out of place on a 1940s D'Angelico. He also subtly altered the body contours, in particular opening up the scroll, which yields slightly more interior space, adding a bit of volume and lower-end response. He also reshaped the body at the neck juncture to improve upper fret access. 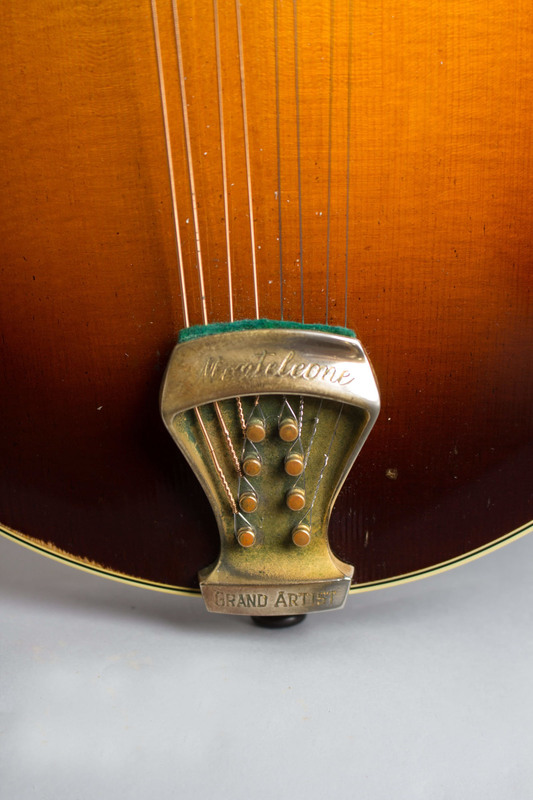 This is a fairly early example of the Monteleone Grand Artist, made in 1979. It is immaculately well-built of the finest curly maple and tight-grained spruce, with a beautifully blended sunburst finish on all surfaces. While most bluegrass-oriented players have been loath to move on from the traditional Gibson F-5, a number of progressive mandolinists have made extensive use of Monteleone's creations including David Grisman, Don Stiernberg, and Mike Marshall. 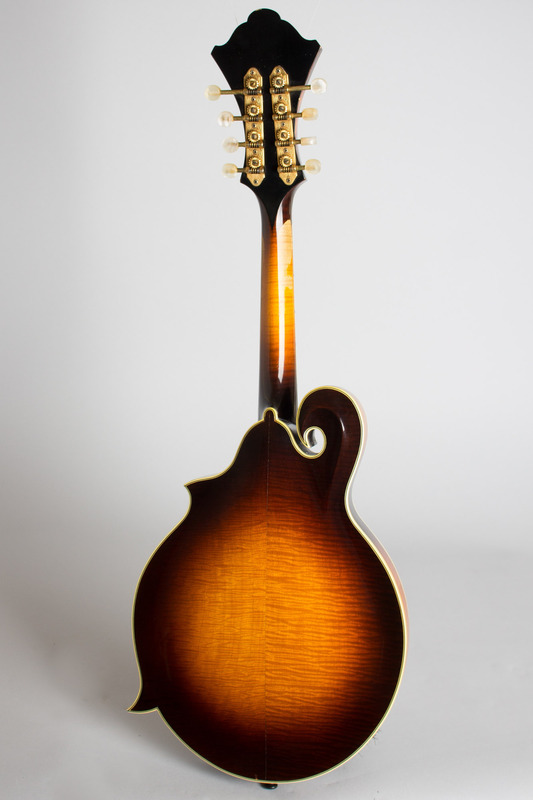 It is very rare in this traditionally-oriented world for a modern instrument to become a true classic, but apart from the F-5 and the many nearly identical copies, the Grand Artist stands alone as one of the most highly regarded of all mandolins from any era. Overall length is 27 5/16 in. (69.4 cm. ), 9 15/16 in. (25.2 cm.) wide at lower bout, and 1 5/8 in. (4.1 cm.) in depth, measured at side of rim. Scale length is 14 in. (356 mm.). Width of nut is 1 1/16 in. (27 mm.). This mandolin shows some playwear; it has been a working instrument and shows the scars of many gigs. There is a notable spot of pickwear into the wood on the top in the spot Gibson traditionally put a pickguard in and some other small dings and scrapes to the top finish. 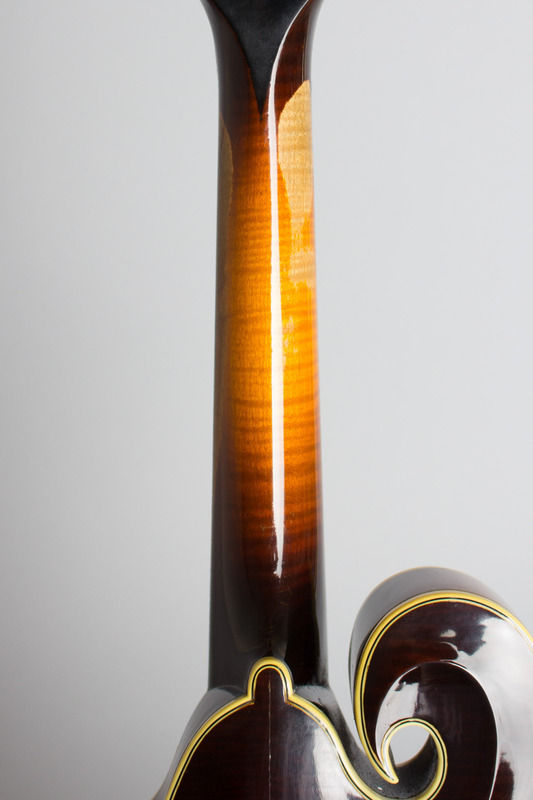 The lacquer on the back of the neck is worn down to the wood on both sides, in a larger area on the treble edge. 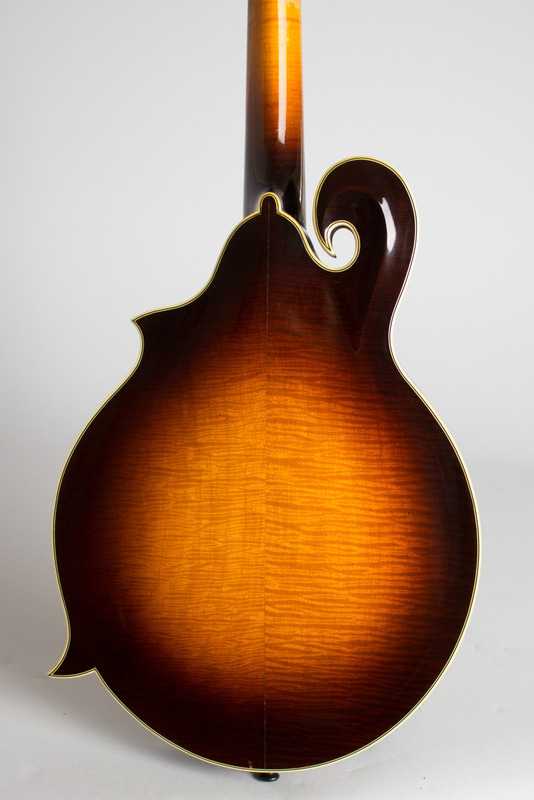 The mandolin has been refretted very neatly and the back center seam has been resealed. The tailpiece shows some corrosion and loss to the plating. 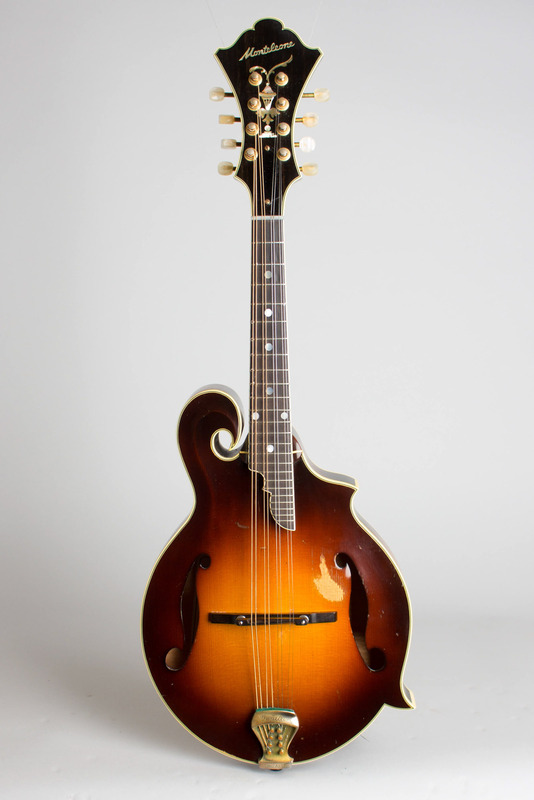 While many of the superlative instruments from this maker have been preserved as if in amber and rarely played seriously, this mandolin has been used as a tool to make music as the maker intended. The legacy of that is a fantastic feeling instrument with a truly gorgeous sound, developed over many years and distinctive in its own right. 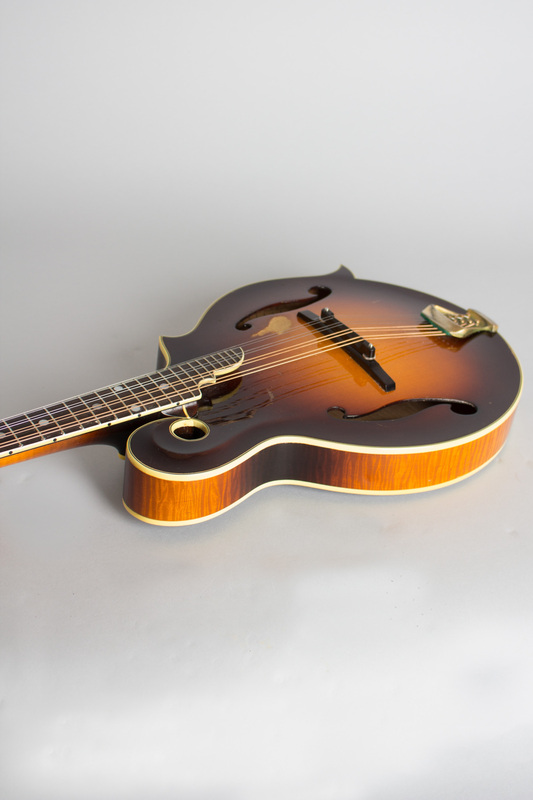 The Monteleone Grand Artist is one of the few mandolins of this caliber to depart so successfully from the established Lloyd Loar pattern and still be regarded as one of the world's finest instruments of its type. 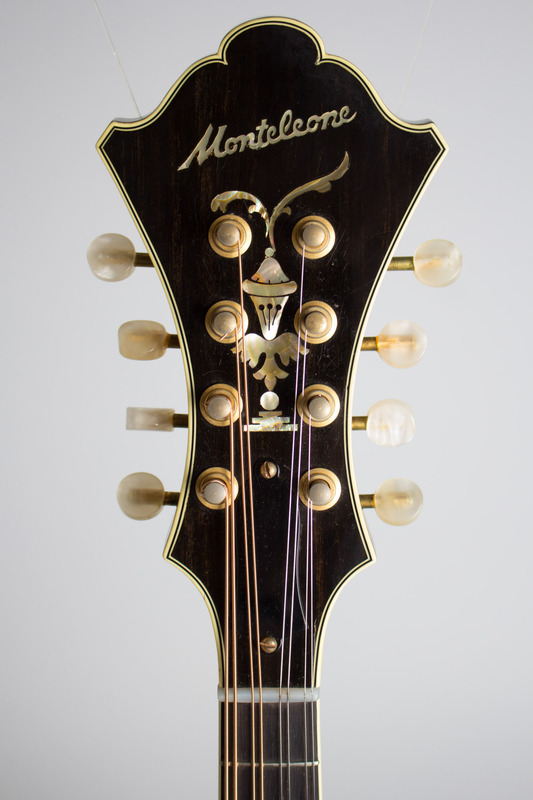 This Monteleone is simply one of the finest post-1920s mandolins we have heard, a joy to play and to hear. Excellent - Condition.